What a lark and see the hypocrites going along their way as they look down on people who are on state benefits. However there are some arguments that suggest that some people through no fault of their own who happens to be in certain situations which is the root cause of why they have ended up on state benefits such as they lose their jobs and mental health issues which can happen to any one of us at any stage of our lives. To be frank nobody likes to be on state benefits and it’s still shocking some people they view people who are on state benefits are of lower class and dare I say it as a way how parents educate their children to use say to their children to encourage them to use a form of caste discrimination to encourage their children to do better in their education to get a better job. The truth is this is one of the worse way to teach their children to discriminate against people who receive state benefits. Yes we can encourage our children to do better by showing them to study harder and reward them when they get a good grades result in their school report. Changes to benefit rules coming into force this week could push 200,000 more children into poverty, say campaigners. From Thursday, payments for some benefits will be limited to the first two children in a family. The Child Poverty Action Group and Institute for Public Policy Research say some families will be almost £3,000 a year worse off under the new rules. Ministers say they are determined to tackle the root causes of disadvantage and make work pay. The changes affect families who claim tax credits and Universal Credit – which is in the process of being rolled out and is due to replace tax credits completely by 2022. The new rules mean that children born after Thursday 6 April into families where there are already two or more children will no longer be counted in benefit payments to their parents, under either tax credits or Universal Credit. And from autumn 2018, families making new claims under Universal Credit will only receive payments for their first two children even if they were born before Thursday. However, children already receiving Universal Credit or tax credit payments will not lose them for as long as their family’s existing claim continues. And child benefits which are separate will be unaffected. The latest official figures show that 872,000 families with more than two children were claiming tax credits in 2014-15. And a similar number of families are likely to lose out under the changes, the researchers suggest. In 2014-15, two thirds (65%) were working families and 68% had no more than three children, say the researchers. 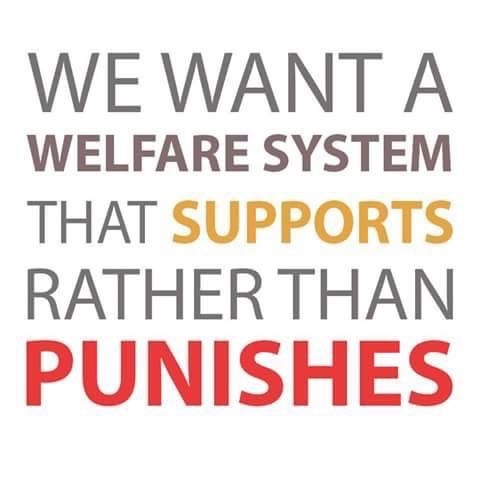 Based on those figures, the researchers calculate that once the new policy is fully implemented an additional 100,000 adults and 200,000 children could face poverty. Among those affected will be families with more than two children who are not currently on benefits but who might need to claim in future because of unforeseen redundancy, illness, separation or death, the researchers warn. “It may also leave women who become pregnant with a third child, for example through contraception failure, with a difficult choice between moving into poverty and having an abortion,” they add. The researchers also criticise a lack of advance publicity about the change on the main universal credit website, particularly if the policy was intended “to inform parents’ choices about having children”. Child Poverty Action Group’s chief executive Alison Garnham called it a “particularly pernicious cut because it suggests some children matter more than others”. “It’s also illogical because no parent has a crystal ball,” she added. “Families that can comfortably support a third child today could struggle tomorrow and have to claim Universal Credit because, sadly, health, jobs and relationships can fail. It is claimed disabled people in the U.K. are ‘left behind in society’ and have ‘very poor’ life chances a report has found. This report by The Equality and Human Rights Commission said progress towards equality in the past 20 years was ‘littered with missed opportunities’. 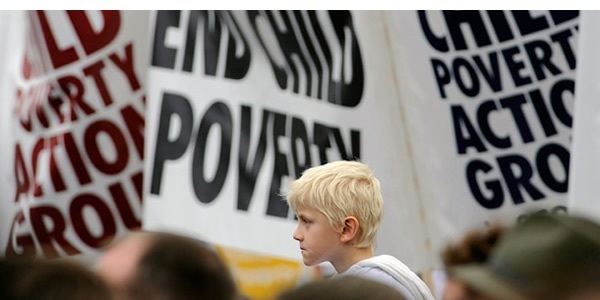 It is reported on 25 June 2015 that the number of UK children classed as living in relative poverty remains 2.3 million, government figures suggest. It’s been purported that the Department of Works and Pension annual estimate shows the proportion affected – almost one in six – was unchanged from 2011-12 to 2013-14. Work and Pensions Secretary Iain Duncan Smith said UK poverty levels were the “lowest since the mid-1980s” and showed government reforms were working. But charities said proposed welfare changes would leave families worse off. A child is defined as being in poverty when living in a household with an income below 60% of the UK’s average. Average household income in 2013-14 – before housing costs – remained unchanged from 2012-13, at £453 a week – making the poverty line £272 a week. Mr Duncan Smith told the Commons that government reforms of the welfare system were focused on “making work pay” and getting people into employment. He said he remained “committed” to dealing with the “root causes” of poverty, saying employment was up by more than two million since 2010. Shadow chancellor Chris Leslie accused the government of failing to make progress in cutting child poverty and raising incomes. The figures represented a “depressing slow-down in the progress we should be making as a country”, he said. Javed Khan, chief executive of children’s charity Barnardo’s, said every child living in poverty was a child that was being “let down”. Matthew Reed, chief executive of the Children’s Society, said there has been a “steady rise” over the last five years in the numbers of children living in poverty in households where parents work. He said 200,000 more children have been pushed deeper into poverty over the past year. It comes as the government has said it wants to change the way child poverty is measuredas it believes the current measurement is inadequate. It’s a sad day to every corner we turn we witness Junk Food Projects, Food Banks, Soup Kitchens and most of all the increase of homelessness, rough sleepers, mental health, learning disabilities, low income families depends on those new voluntary services to provide a service which in some cases lack funding and left to fend for themselves to raise the funding for a level playing field against big charities that receive the bulk of the funding from some councils. What’s more disturbing is the government gives the talk but refuse to take action. It’s no wonder why some people who can use their votes refuse to hold both the government and the official opposition to account because of this, politicians are let off the hook and they are the ones who moan the most. To put it in a nutshell if you don’t vote, you don’t have a say. Created the Future Jobs Fund, creating over 100,000 new job starts for young people, reducing youth unemployment. Introduced Connections, a service for young people which gave advice and information on jobs, careers, learning and training. Created the New Deal, which helped the long-term unemployed to find work. Introduced the National Wage(NMW), now fighting for real Living Wage. Introduced the right to 28 days of paid leave. Equally of rights between full and part-time workers. Increased paid maternity leave from 14 to 39 weeks, introduced 2 weeks of paid paternity leave. 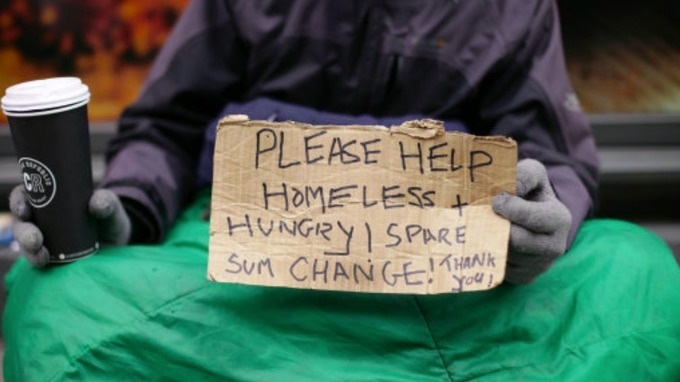 70% reduction in the number of people in the number of people sleeping rough. 94% decrease in the number of families being placed into inadequate bed and breakfast accommodation. Repaired and improved 1 Million council houses to meet the Decent Homes Standard for council houses. Isn’t ironic Just over half of the people who have received taxpayers’ money to help them buy a home under a government scheme did not need it, according to research. About 4,000 households in England earning more than £100,000 annually are in the Help to Buy Equity Loan scheme. Official figures to December 2016 show more than 20,000 households who are not first-time buyers have been helped. The initiative, which started in April 2013, aims to make buying a home more affordable. It is suggested that research for the Government found 57% of those who signed up to it said they could have afforded to buy without access to the scheme. Help to Buy was launched by then Chancellor George Osborne to attempt to encourage more housebuilding. The government offers a 20% equity loan to buyers of newly-built properties and 40% in London, on properties worth up to £600,000. The buyers have to put down a 5% deposit and, when the property is sold, the government reclaims its loan. This means if the value of the home goes up, the government will make a profit. Similar schemes were set up and have now ended in Scotland and Wales. Gavin Barwell, the housing and planning minister, said: “We’re committed to helping more people find a home of their own with the support of a range of low-cost home ownership products. The government said it had committed £8.6 billion for the Help to Buy Equity Loan scheme to allow it to run in England until 2021. Labour’s shadow housing secretary John Healey said: “While the number of younger people who own a first home is in freefall, the number of government-backed affordable homes to buy has fallen by two-thirds since 2010 and badly targeted schemes like Help to Buy are not focused on those who most need a hand up. George Osborne faced a Tory rebellion on Thursday night which could block his plans to cut benefits to thousands of disabled people. Scores of Conservative MPs warned the Chancellor that they will force him to roll back on controversial Government plans to cut the welfare claims of 640,000 disabled people to save £1.3 billion. 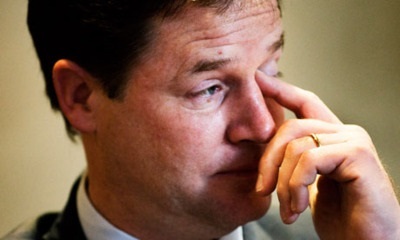 One prominent backbencher warned that Mr Osborne has “zero chance” of getting the measure through Parliament. The rebellion is a blow to Mr Osborne’s authority and came as MPs also vowed to oppose the Government next week over European Union taxes on tampons, solar panels and home insulation. George Osborne’s budget will disproportionately benefit the rich, with little if any help given to the poor, according to a review by the Institute for Fiscal Studies. The richest 10% of Brits will benefit to the tune of £250 a year each from yesterday’s announcements alone. And there was little or no benefit from yesterday’s tax and benefits announcements to the lowest 50% of earners – who will already be up to £1,500 a year worse off after tax and benefit changes introduced since May’s general election. According to the IFS, some 43% of the population now don’t earn enough to pay income tax, and so will see no benefit from the Chancellor’s increase in the tax-free personal allowance. But Mr Osborne tossed high earners a bung in the budget, by bumping the threshold for the higher rate of tax up to £45,000 a year. Rich non-doms were given a year in which to sell or dispose of their UK based houses and assets before they have to pay tax on them. Capital gains tax saw another cut, as did corporation tax which remains the lowest of any G20 country. Those that can afford to save were given huge incentives to put money aside – with the Lifetime ISA offering a £1 bonus for every £4 saved up to £4,000 a year, and the upper annual limit on tax-free ISA savings lifted to a whopping £20,000. And people living in social housing who have ‘spare rooms’ are still hit with the Bedroom Tax, owners of swanky second homes were told they could earn £1,000 tax-free by renting them out through AirBNB. Child Poverty Action Group Chief Executive Alison Garnham said: “Yet again the independent evidence shows hard-up households are losing most while the better off gain from tax cuts paid for by all of us. “And in the pipeline there are cuts to universal credit which will further clobber low-earners just as the cancelled tax credits would have. And today it emerged that some 290,000 sick, vulnerable and disabled people will lose £4,100 a year. 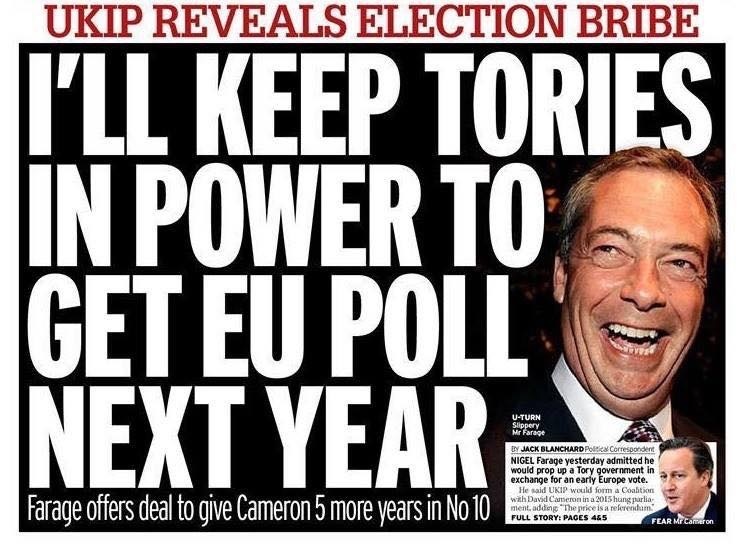 To put this all into prospective it’s no wonder why that Phillip Hammond and other senior Tory MPs were hoping that Ice Queen Theresa May would call for early general elections that was never to be. This is why George Osborne is having the last laugh at disabled people and people who are on state benefits. Do those high opinionated people really know the root causes of those people who are homeless and rough sleepers to make those assumptions? Some of the foodbanks, junk food projects, and soup kitchens depend on people’s, churches, and supermarkets donations to help people just to survive or make ends meet by providing those services. To me those are the people who run those projects are the unsung heroes unfortunately the government pays lip services to them instead of helping them to promote those well-deserved projects. Take for instance well established companies puts a bid into the local government funding to help homeless and rough sleepers they make bold claims that they WILL provide a joined up services yet it seems a long wait and being bogged down with red tapes and yet after all of this they received the funding whilst the small projects get nil so much for the so called shared society. The irony of this is when politicians are standing as candidates whether it’s local or general elections they all turn up to those projects to play lip services which is a insult to the organisers and on the odd occasions at full councils and in parliament opposition parties mention of those projects yet the current government airbrush it over with spin by claiming that they are doing more for homelessness and rough sleepers yet both previous and current governments still have not really addressed the real issues of homelessness and rough sleepers. If there is any white paper floating around there is very little that really mentions homelessness, rough sleepers, food banks, soup kitchens, and junk food projects however more can be done to address this by those project managers to lobby their MPs and local Councillors with their service users. “Don’t you just like it when some people say “they don’t do politics” They rather go to the pub and spend a few quid on a pint of real ale with their friends. Well every thing involves politics even the very water you drink involves politics this is the hush reality and fact of life and there is no getting away from it. It is said that the Foreign Secretary (Boris Johnson) has promised that those who prophesied doom over Brexit will be proven wrong. Well Joker Johnson there is a saying that a promise is a comfort to a fool. How about acknowledging that hate crimes have increased post Brexit against EU citizens, foreign nationals, Jews and Muslims in U.K. and what is the Conservatives are doing to address this issue. People don’t want lip services they want to see action taken against the perpetrators. For all the spin that the establishment gives on Brexit it’s no wonder why Nissan is in panic mode and seeking assurances that the establishment that they will continue to keep UK a competitive nation to do business after it leaves the EU. Thanks to the people who voted for Brexit people are being to see a raise in prices like household items, food, mobile, gas, and electricity bills. In light of this the question I will to all the political parties in the UK now the vote for Brexit has taken place how many MEPs will continue stand for the European Parliament now Brexit has taken place. 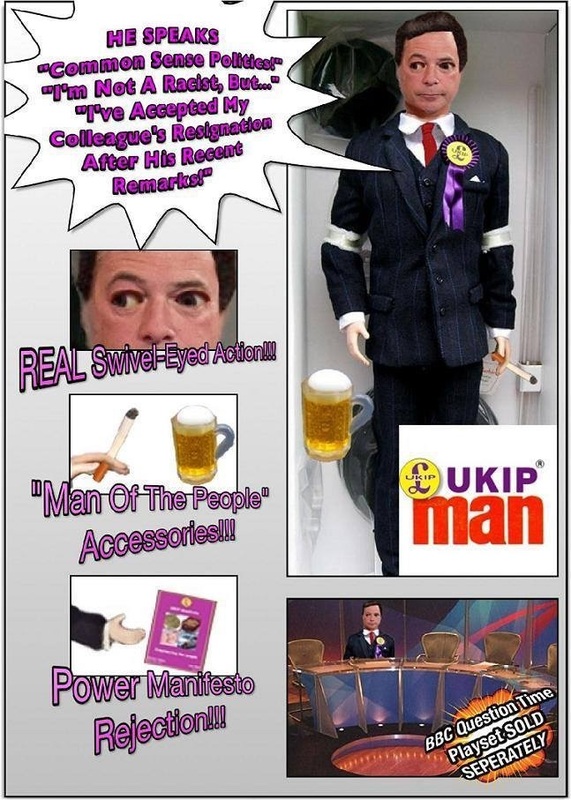 Moreover, will UKIP still continue to stand as candidates In European Parliament as their continued to be leaderless or will we see the return of Nigel Farage to emerge as the new leader of the one man party (UKIP). Somehow I’m reassured that Labour Party have asked 170 questions to parliament to get some answers about the establishment position for the economy post Brexit to get an idea of the government stance. Let’s be honest it was the Conservatives who to introduce Private Finance Initiative(PFI) which they did in small parts during Thatcher and Major reign and when Labour got into power they carried on with much of the policy in public services. 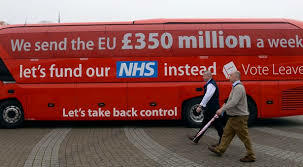 I do seem to recall that a certain Boris Johnson saying that if the nation votes to leave the EU that our NHS will be better off out of EU by £350 million. If this is the case where is the money gone to as our NHS could do with this money now. An MP is demanding the health secretary investigates how a private firm running dozens of GP surgeries and NHS walk-in centres is handling its finances. Whilst on another hobbit journey towards the end of 2014, one had a sense of history rearing its ugly head again. Trade unions went on strike it was a matter of time the conservatives got their cages rattled again by the trade unions the Conservatives as usual ran like ostriches by burying their heads in the sand until the dust settles then they reappear with knee-jerk reaction policies by going for the jugular of the trade unions just like Mrs Milk Snatcher (Maggie Thatcher) did in the 1970s and 1980s. 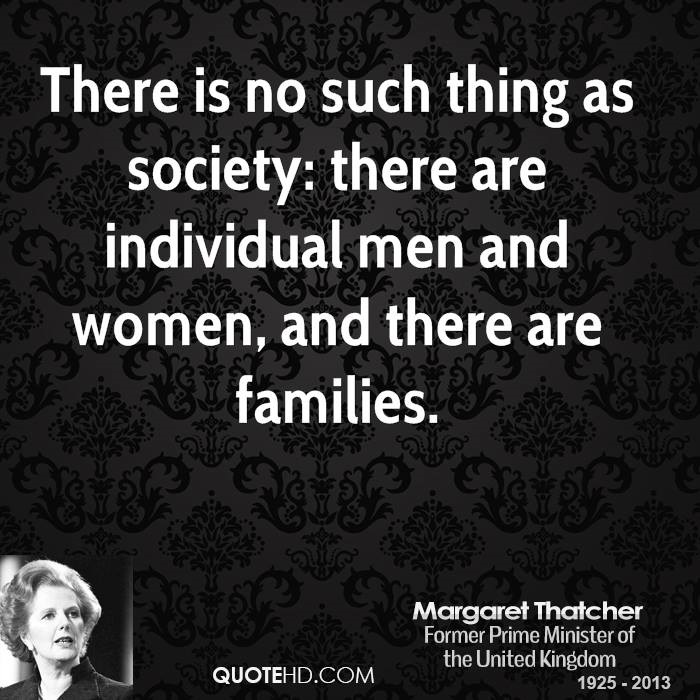 The difference is Maggie Thatcher has been resurrected from her grave under the guise of one David Cameron with his fatcats to continue notch up the pressure on trade union democratic rights to withdraw their labour until they receive a decent wage for a day’s work. 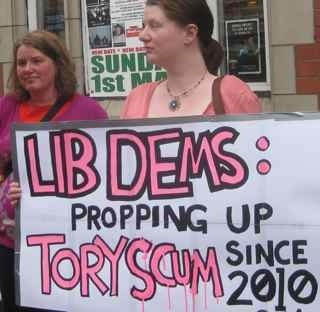 Let’s not forget some members of parliament (both Conservatives, and LibDems) did not get elected on a 40 per cent mandate yet they want to impose their will on the trade unions. 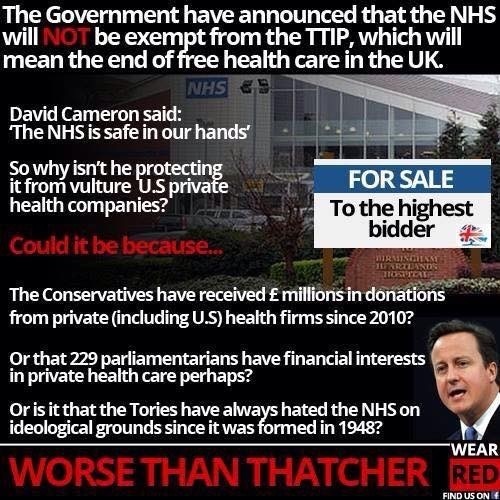 What a damn cheek of David Cameron to claim that he cares about our NHS. His only agenda is to privatize it to the highest bidder to make a fast buck to his rich pals worst still to come by forming an alliance with UKIP to introduce a health insurance to fund our Public sector. We know which side David Cameron is on of course it’s the private sector which plays into Labour hands. “The answer, in my view, when we have some of the toughest laws in the world, is not new legislation, it’s a proper approach to industrial relations,” he told Andrew Marr. For all the right-wing media’s appetite for a crackdown, Mr Cameron has alienated not just low-paid workers in the public sector, but bosses too. When striking NHS unions are joined by Managers in Partnership, surely even our Etonian leaders must admit the times they are a-changin’. He’s right it should come as no surprise that the Tories are doing what they’re paid for. Labour activists will be relieved their leaders can call a ploy a ploy. But whatever happened to aspiration? The sheer hypocrisy of the Tories’ latest attack on trade unions shows their complete disdain for democracy, in unions, in workplaces or in the country as a whole. As Paul Kenny of the GMB has pointed out, if you applied this test to the 303 Tory MPs who took up seats at the last general election, only 15 of them would have been elected. And yet they were quite happy not just to take their seats but to go on and form a government. Indeed, if they wanted to do something to increase participation in industrial action ballots they would start by scrapping anti-union laws which force postal ballots on trade unions and bring back workplace ballots. But of course this proposal has nothing to do with democracy. Rather, as TUC general secretary Frances O’Grady has said, it is about effectively ending the right to strike in the public sector. Of course that is what really frightens the Tories. The wave of strikes across the public sector since 2010 has shown a trade union movement which is beginning to awaken. Our movement is comprised of 6.5 million members, working in every industry in Britain. But it is also much more than that. It represents many millions of workers, whether trade union members or not, up and down this country. It represents their families, their neighbours and their communities, both rural and urban. Our movement represents the young unemployed workers who cannot get jobs because this government took them away. It represents the parents who have not only seen their children’s education destroyed by privatisations and fragmentation but have also been hammered by changes to the tax system. It represents the children who turn up hungry to school every day because the government has forced their families into poverty. When that movement begins to awaken, the Tories and their paymasters are right to be afraid. And they will use every trick in the book, both legal and extra-legal, to protect their power and their privilege. The time to fight back is now. 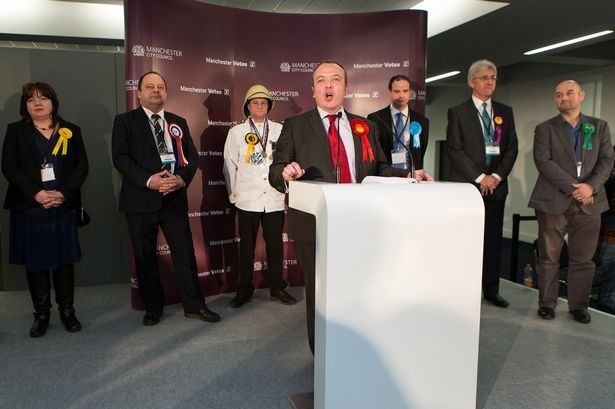 Sweeping away this government of the rich for the rich at the general election in May will be a first step, but it is no more than a beginning. It is the entire conservatives system which is rotten and that rot needs to be cut out from the core. 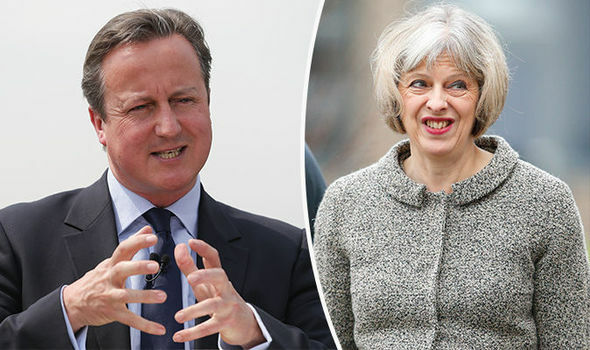 I continue to maintain to get rid of the Tories and replace them with a Labour majority on 7 May 2015 or you will wake up on 8 May 2015 with with FIVE more years of Conservatives destroying our public service. Many of us in the Labour Party will be campaigning for a Labour majority in General Elections 2015 and will not want to seek a deal from UKIPPERS as it goes against the core values of Labour. 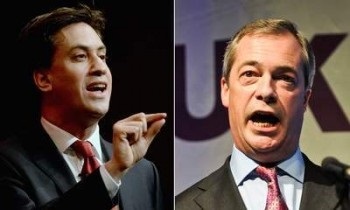 UKIP cannot even match up to Labour policies so by all mean sell your members down the drain UKIP as we all know what the Faragegate stand for to do a deal with the devil in order for the UK to come out of European Union and sell off our NHS to private insurance companies like the American style system. 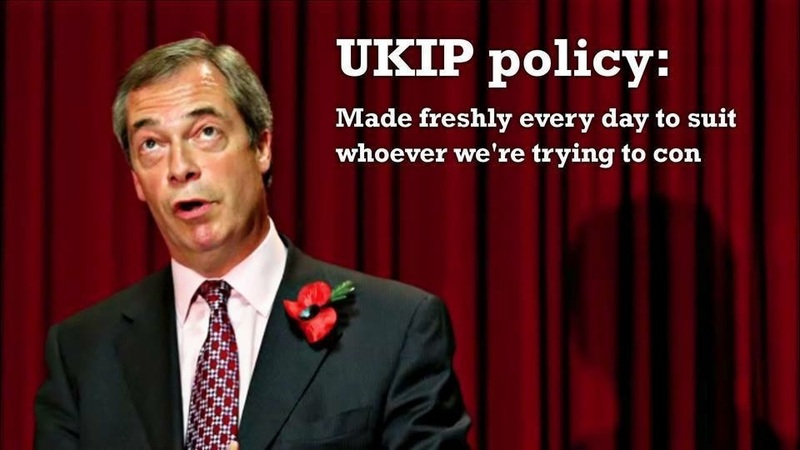 Now that UKIP has been caught out its all of a sudden oh no we changed our mind. It’s little wonder why UKIP is called a wishy washy party first UKIP claimed they are happy to form a coalition with Conservatives, now they want to be bed partners with Labour it’s no wonder why UKIPPERS can’t be trusted to help run the country or be trusted in a coalition with any political party. We are consistently being deceived by UKIP and the Tories who both want an American led private health system but dare not say so as 99% of the public want to keep the NHS – Cameron lied when he said that there would be ‘no top down reorganisation’ and he is lying now when he says that he wants to protect the NHS On 9th September 1982 Thatcher proposed the dismantling of the NHS but the majority of her cabinet were horrified and rejected the idea the minority have been planning ever since to remove your rights to free health care. Did you tell a meeting in September 2012: “I think we are going to have to move to an insurance-based system of healthcare. Frankly, I would feel more comfortable that my money would return value if I was able to do that through the market place of an insurance company than just us trustingly giving £100bn a year to central government and expecting them to organise the healthcare service from cradle to grave for us”? Can you confirm that your Deputy Leader congratulated the current Government on “bringing a whiff of privatisation into the beleaguered National Health Service” and warned that “the very existence of the NHS stifles competition”? Do you disagree with your new recruit Douglas Carswell who in 2012 called for “open market” in healthcare contracts and in 2013 he supported the Government’s catastrophic top-down reorganisation of the NHS, even calling it, of all things, “modest”? Will you instruct Douglas Carswell, who voted for the Health and Social Care Act, to support Clive Efford MP’s Bill to stop the privatisation of the NHS? Why did you endorse a 2013 article from Jonathan Stanley in the process describing him as “A UKIP health spokesman” – in which he suggested allowing GPs to “charge a flat fee to see non-emergency cases”? Did you, in 2013, when speaking specifically about jobs in the NHS say, “there is plenty of room for cuts and efficiencies”? UKIP continues to be economically with the truth by nicking some of Labour policies which they fail to inform their membership the whole truth and have the gull to claim they are the party of working class is so laughable. Here’s is a classic example for you all; UKIP says that they want to implement the Australian point system in UK for their immigration policy. 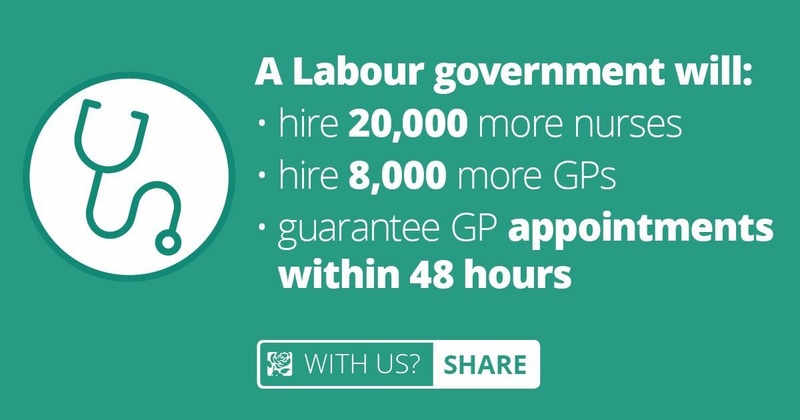 The sting to this is, it’s a Labour Policy which they failed to implement during the last days of a Labour government. Lastly why we are not surprised by the desperation of UKIP put a legal challenge to prevent UK from continuing to comply with the European Arrest Warrant which failed. Three high court judges rejected the Treasurer Stuart Wheeler’s bid to block moves to rejoin the scheme which facilitates cross-border extradition. Wheeler tried to argue that under existing UK law there should be a referendum before such a “transfer of power”. He seems to conveniently forgot about Members of Parliament voted to support the warrant and 35 other EU justice powers on 10 Nov 2014 and Labour will put forward a motion on opposition day The EU Arrest Warrant on the 19 November 2014 just before the Rochester and Strood by-election which I’m almost sure will be supported by cross party voting for it. Many of you will have noticed that the right-wing press never want to report Britain needs a pay rise as they had no choice but to report it could it be that they want to see a Conservative and UKIP coalition. I can only come to the conclusion that it doesn’t matter as those marchers are a bunch of hard lefties. This demonstration also took place in Glasgow, and Belfast to coincide with England people from all walks of life turned up to show their anger at this vile coalition who are offering a below inflation 1% whilst Members of Parliament are happy to receive their pay increase which amounts to 11% in 2015 and the European Parliament MEPs gets €96,246 which does not includes their benefits. 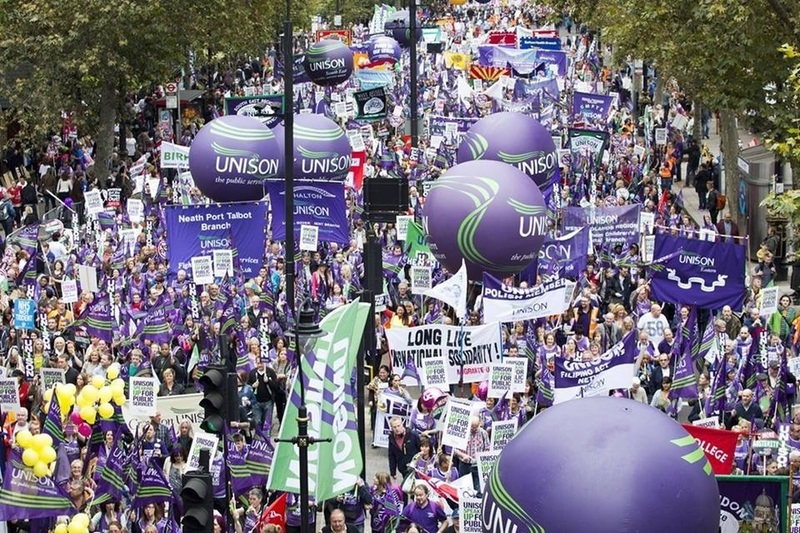 Midwives who took strike action this week for the first time ever are among tens of thousands of trade unionists taking to the streets of London and no one can claim that they don’t know the value of labour. 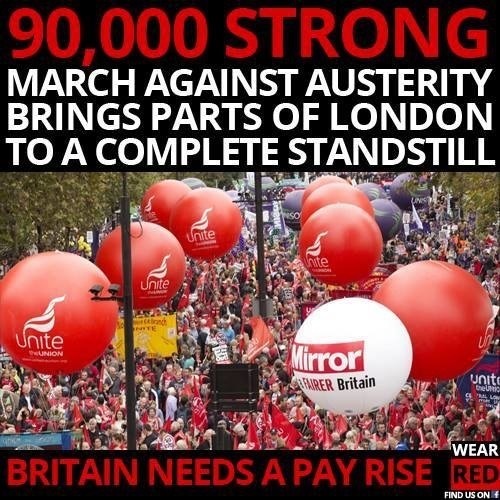 A march from the Thames Embankment to Hyde Park will see heroic trade unionists joined by students, housing campaigners, anti-nuclear activists and many others in calls for a new politics of hope at the TUC’s Britain Needs a Pay Rise march and rally. Meanwhile thousands more are expected to join a sister march and rally taking place in Glasgow dubbed A Just Scotland: Decent Work, Dignified Lives. 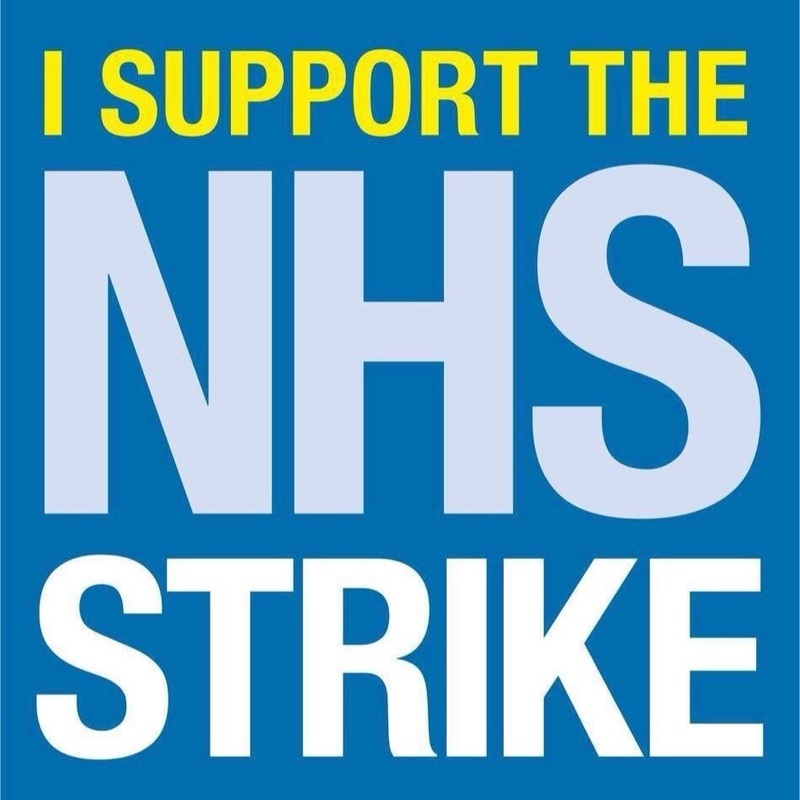 The demonstration comes after half a million workers in the NHS downed tools this week in the first health strike since the Thatcher era and low-paid civil servants brought government to a standstill. Members of the Royal College of Midwives (RCM), which is not affiliated to the TUC, received an ecstatic message from the union’s chief executive Cathy Warwick urging them to take to the streets. She said: “I really encourage those that can make it to join us on Saturday so that we can show the government just how strong their feelings are and how much support there is for fair pay. TUC research has found the average worker is now a whopping £50 a week worse off than in 2007. On the 17 October the TUC general secretary Frances O’Grady, said she will address crowds in Hyde Park launched a rallying cry for a fairer Britain. “After the longest and deepest pay squeeze in recorded history, it’s time to end the lock-out that has kept the vast majority from sharing in the economic recovery. And lecturers’ union UCU leader Sally Hunt will use her speech in Hyde Park to blast the “narrow nationalism” of Ukip. “Britain needs more than just a pay rise, we need real change,” she is set to say. I have to say that I’m intrigued to say which I don’t normally do even the private sector workers have taken to the streets on 18 October they also belong to trade unions. Also public sector workers pay the same tax as everyone else. 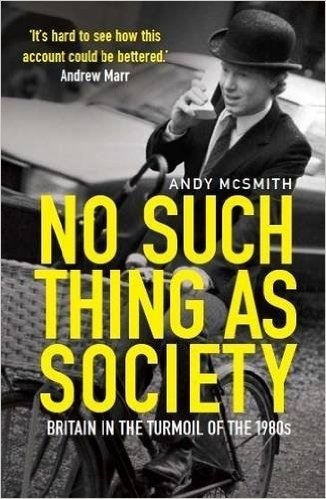 It is also wrong to say public sector are not wealth creators a very narrow view. My local authority for example works with the business sector to help enable growth in businesses be they large or small, we are also putting in reserves to create business opportunity that is wealth creation. Never in this country have those who fight for democracy and social justice carried a greater burden or faced the possibility of bigger losses of human rights, human freedoms, human dignity and wellbeing than they do right now. As the poor and disabled suffer and have to pick up the crumbs from the dining tables of the fatcats, and bankers. They rather put their finance in offshore accounts rather than paying their fair share of taxes. Yet the The TaxPayers’ Alliance have produced a report, and assisted by Harry Phibbs concerning the vast amount of space Trade unions are provided with in public sector buildings – at little of now charge. It amounted to at least 273,753 square feet in 2013-14. This is more than the total floor space of the Grand Kremlin Palace in Moscow nothing more than a distraction as to why the trade union members when on strike on 18 October which they play into the hands of Conservatives and UKIP. 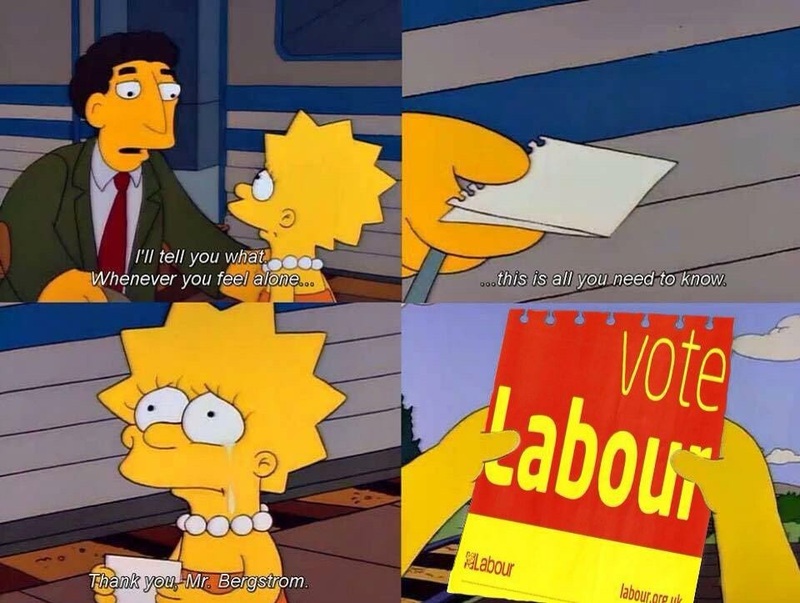 Let us all not forget It was your government that lost us the triple A Fitch and Moody credit rating, inflicted socially and economically damaging austerity on only the poorest, whilst handing out our money to the millionaires, and your government that borrowed more money in 4 years than Labour did in 13. And Labour had the global recession caused by irresponsible bankers to deal with. And they did. 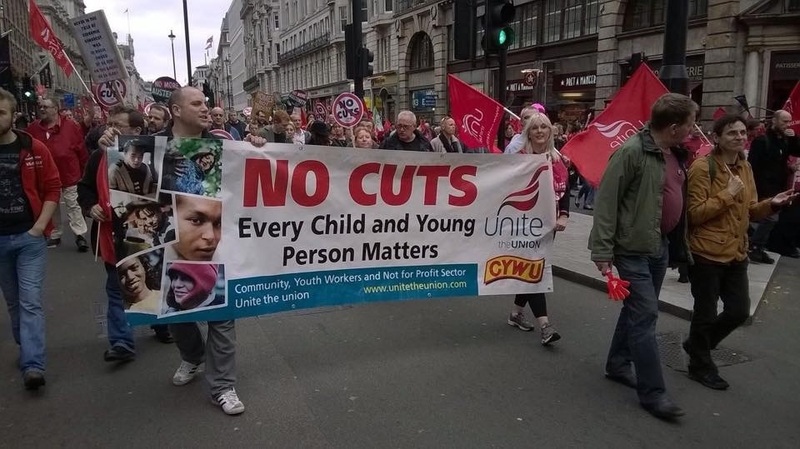 No austerity cuts from them. We were out of recession in 2010, and you, Mr Cameron, with YOUR government’s policies that manufacture gross wealth inequalities, caused another recession. Be a man. Tell the truth. I say to them we will fight them at the hustings, we will fight them at the ballot box; we will fight them for the minds of the People. We shall never surrender. 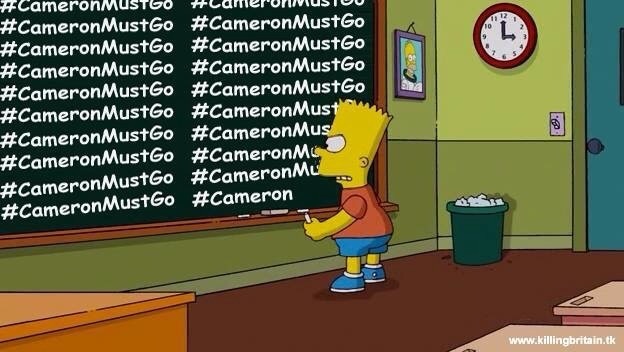 In 2015 if people let the Tories win the only thing they will guarantee is years and years of more austerity. On such a scale that it will scare the UK in such a way it will never recover. That is the stark truth. The Tories want to destroy social justice, equality and fairness. Their overriding plan is to sell of every single public service to private companies. Regardless of standards, commitments to service, protection for those least able to get by and with no regard to the real economic impact having hundreds of thousands more people on the dole. 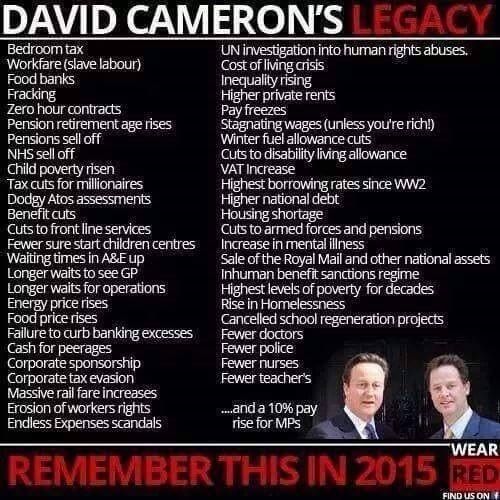 Have no doubt this is what the Tories want and are hoping you will fall for it all over again. They want another £20 billion in cuts. That is on top of the multi billions already taken away. Now no matter the lies and spin the cuts have done nothing to bring down the deficit and that money seems to just vanish, but it’s going somewhere? When people say there is no difference between the political parties they really need to think before they say that. The only hope every single public service and public sector worker have is with Labour winning in 2015. If not then what is happening now will seem tame in comparison.